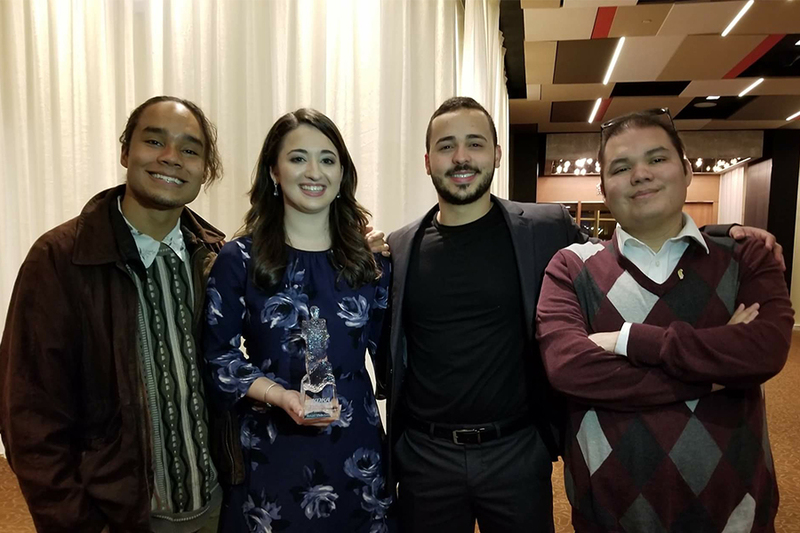 KDKA Radio’s annual event that honors individuals who are giving back and making a difference in their local community recognized Carnegie Mellon University third-year student Rosana Guernica. Guernica, a decision science major in the Dietrich College of Humanities and Social Sciences, was named one of "Larry's Hometown Heroes" for her work coordinating and delivering aid to Puerto Rico following the devastation from Hurricane Maria. The event, which is hosted by the station’s morning host Larry Richert, also recognized Stephanie Scoletti, a cancer survivor who created the Young Adult Cancer Support group; Sharon Boone, cofounder of Outreached Arms, a group that supports homeless and less fortunate individuals; Samantha Finigan, director of outreach for the Three River’s Rowing Association; Eric Howze a former homeless veteran who runs Operation Homefront 22; and Steve Monteleone, founder and CEO of It’s About the Warrior Foundation, which assists and empowers local post 9-11 veterans. Larry Hometown Heroes Lifetime Hero Award was presented to Pittsburgh sports broadcaster Bill Hillgrove for his philanthropic efforts within the community and through the University of Pittsburgh. After the hurricane hit Puerto Rico, Guernica began chartering flights to evacuate at-risk patients who couldn’t find a way out. She applied organizational behavior and decision-making tools from her studies to help save lives. In doing so, she found her calling. Guernica, said the humanitarian work changed her, and it made her realize the impact she could have on people’s lives through public service. Between October and December 2017, the Guernica completed five relief trips that delivered 76,500 pounds of supplies to the island and evacuated 296 people to the U.S. mainland. To pay for the flights, she raised more than $250,000, the bulk of which came from an online crowdfunding campaign. Pictured above are members of Guernica’s team. From left to right: Javier Spivey (CFA ‘19), Rosana Guernica, Gabriel Ostolaza (E ‘17, ‘18) and Ivan Cao-Berg (S ’09).